*These are extra items that I added from the farm’s web store. Friday we’ll be eating out at a work function. Pork Rind: I will attempt some cracklins or chicharrones. We’ll do something with the potatoes to go with the NY Steak (primarily for ON (Oldest Nephew) who needs bulk or he’ll eat all the NY Steak). I usually do at least one breakfast a week that includes sautéed green. On Sunday I look at what we have on hand still and figure out what to eat that night. It’s been fun combining eating local with eating Paleo. 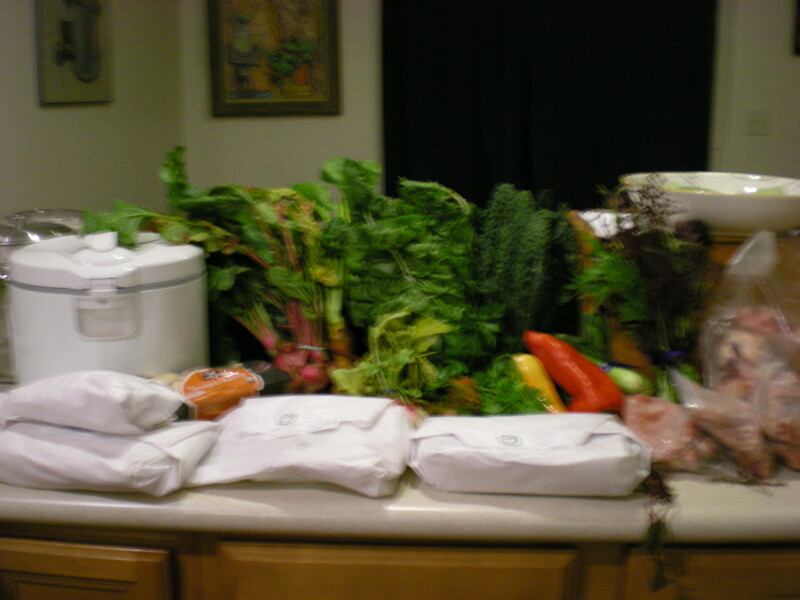 This entry was posted in Locavore and tagged Airedale, Ancestral Diet, Cooking, Paleo, Paleo diet, Paleo Lifestyle, Raw Meaty Bones Diet, sustainable food, Tara Firma Farms. Bookmark the permalink.